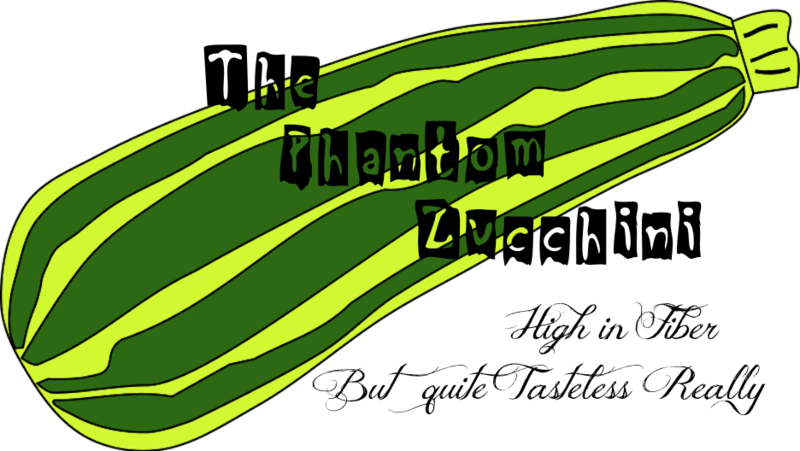 The Phantom Zucchini: The Blogathon Post!! 'Tis the season of blog parties. I'm a total recluse to the point of hiding under the bed when the phone rings not really a joiner. But since I resurrected this blog recently (dirty, dirty work) I thought I'd try to get myself back "out there." See, even that term sounds pretty darned scary doesn't it? "Out there" suggesting that you're about to step off into space, the great void, the unknown, without any promise of safety or return or even keeping all your body parts. But still, I signed up for the Blogathon. although I take a bit of pride in being the last link on the blog list, you know, because I don't want to appear cheap or easy. I am indeed quite hard to get. No really. I am. Anyway, as if this wasn't enough of a road block to get through, I realized soon after I decided to join that there was actually something I had to do - actually lots of somethings. Seeing that you guys don't really know me yet, (although I feel a strange bond, a familiarity with you that I just can't describe as anything other than, well, weird) I have to confess something to you, tell you something very basic, almost primal about me. No, no, no. Don't nod your head as if you know what I mean because you are still feeling bad about quitting Brownies when you were seven. This goes WAY beyond that. I have, single-handedly taken quitting to a new level, a level so high you would have to bribe St. Peter to get to a higher level. I have taken quitting to the level of - well, art, or maybe science, or possibly to the of level those spiritual mystics who sit on pillows all day. It's a high level is all I'm sayin'. So I signed up, left this link and here you are. Yes, I know you tried to slip out the back door, but I anticipated that, familiar as I am with people trying to get away, hence Im' sure you encountered my body guard, Mr. T. Ha!! What a foo you are. Anyway, since you're stuck here, let's go over the suggested activities. So, dear potential readers, Thank you so much for stopping by. If you know what's good for you like, you can become one of my followers simply by clicking a button at the bottom of this page. As a token of my gratitude, I am going to gift you with the traditional offering of my people. GO HERE to receive your free copy of "The Scroll of Wisdom, Secrets of the Ancients." Enjoy it with my sincere blessings. I must say, that was the most interesting kick off post I've ever read in all 5 blogathons! To be clear, those were suggested options, you can do whatever you feel like for your blog. I love this post. Your hilarious!